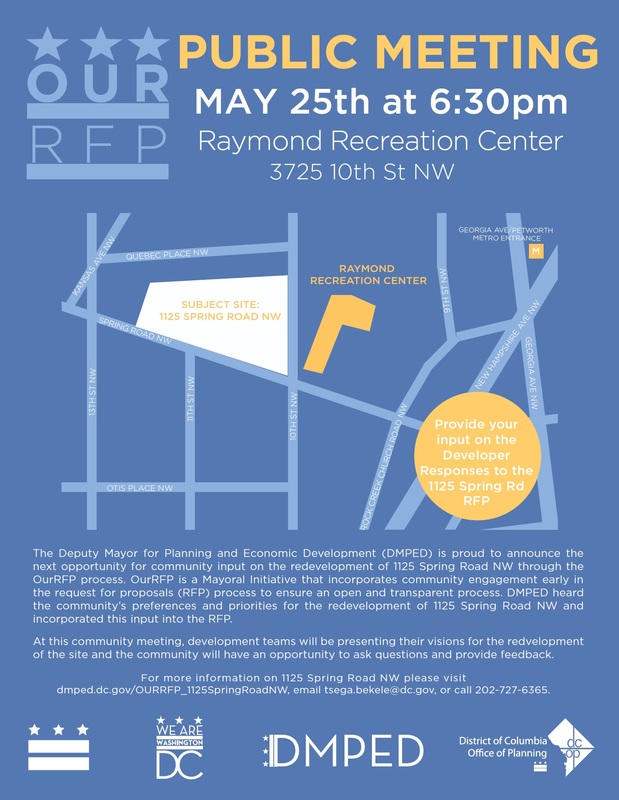 Reminder — Meeting on Developing the Old Hebrew Home is Thursday | Park View, D.C.
Here’s a reminder that on Thursday, May 25th, the next public meeting is scheduled for the redevelopment of the old Hebrew Home on Spring Road. The flyer is below. You can read an overview of the June 3, 2016, meeting here. This entry was posted on May 24, 2017 at 7:07 am and is filed under Development, Housing. You can subscribe via RSS 2.0 feed to this post's comments. I second all of the angst about outside groups like Jews for Justice busing activists in from Maryland, Virginia and other parts of DC. This decision should be made by those that live in the neighborhood. Just those that live near the Old Hebrew Home shouldn’t be able to weigh-in on a local Takoma Park or Chevy Chase (both Ward 4) issues. The nearby community has tried to be engaged, but as others have mentioned, have been shouted down and yelled at by affordable housing activists. I was even shouted at by Jews for Justice as I walked into a Brandon Todd Happy Hour. It was ridiulous and over the top. That being said, I’m sure they will be there and I hope the city officials ignore their political rhetoric. I support affordable housing as a general rule, but to do this 90% affordable, it would take nearly all of the city’s housing fund to subsidize it. How is that fair to the other wards? I think a mix of some affordable, some market rate and some seniors makes sense. And it shouldn’t be able one bedroom apartments. We need some family size units. Finally, I hope the developer is committed to maintaining and securing the building long term. There is an active group of neighbors nearby and they won’t accept anything less. 1) when the first Our RFP was conducted, I was repeatedly asked to wear a sticker calling for more affordability by activists outside Raymond Rec. I think it’s therefore irresponsible for the city to rely on “public input” to drive the direction of this project when that input is being artificially influenced by folks spending time and money to get their message out. I live two blocks from the front steps of the OHH, and I don’t know a single neighbor that wants this to be majority affordable housing because…. 2) best practices for a successful project on all levels– for the residents there, for the continued maintenance by the city or developer, etc — call for mixed income projects. I know we have a shortage of affordable units in our ward and in the city, but clustering them into single developments does not make sense. During the time allotted for public comment, I hope the Commissioners ask commenters to identify themselves by name and address, or at the very minimum, by ward and SMD of residence. Comments from neighbors who live in the immediate vicinity of this huge project should be given considerably more weight than activists from outside the neighborhood whose lives will not be impacted by the development. There must be a way to balance the conversation so that the voices of those of us who legitimately live and spend our lives here aren’t drowned out by people don’t. We live, work, spend money, pay taxes, and work tirelessly to sustain the best parts and improve the other parts of the Community here. We the Community should have the strongest voice in what happens next, because we will be responsible for sustaining it long after the activists and the developers have left.